· Ths is the original, best Rice Milk Soap from Thailand made with the finest Jasmine Rice Extract ingredient and enriched with vitamin B. It can help to maintain skin tone and lighten your skin complexion without any side effects and get rid of the unwanted pimples or acne, freckles, skin blemishes and smooth white face. This natural handmade rice milk soap from the local of Thailand, contains 100% natural rice milk extract from young grown jasmine rice that yields good quality milk enriched vitamins, beeswax and moisturizing oils. Rice milk oil is a natural anti-oxidant and also offers a small degree of sunscreen protection and solves simple problem, acne blemish, and dark spot and excessive dead skin cell build-up. 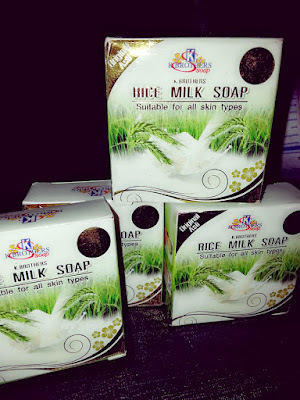 This rice milk soap makes your skin feel smooth and relax with its young rice fragrance. Moreover, rice milk soap can be used for all skin types and is suitable for everyone.